In scenes reminiscent of the efforts of the nationalist residents of Portadown in the 1990s, a peaceful sit-down protest was violently cleared from the street. 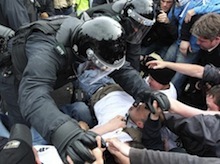 Dozens of riot clad, baton wielding PSNI officers spent nearly five hours to drag the determined protestors from the path of the march, injuring many in the process. After a confrontation that lasted several hours ended in the deployment of water cannon and plastic bullets, riots of an an unexpected intensity erupted in Ardoyne. The riots continued with varying intensity for four nights in north Belfast. There were also serious disturbances across the North, particularly on Monday night. The trouble has led to a public blame game, with PSNI police chiefs criticising the North’s political leadership for failing to find a solution to the parades issue. The parades of July 12, like others of the summer marching season, are held to celebrate Protestant supremacy in the North by commemorating historic battle victories over Catholics. Residents of Ardoyne in north Belfast and other nationalist estates have long opposed the parades, seen as coat-trailing and incendiary. Earlier this month, the Parades Commission, set up under the 1998 Good Friday agreement to adjudicate on parade routes, outraged residents by once again permitting a loyalist march through their community. The outworking of that decision resulted in Monday’s ugly scenes and a predictable riot by nationalist youths, who threw stones, bottles, fireworks and petrol bombs at the PSNI. The nightly violence has been accompanied by a propoganda campaign by the PSNI to rally condemnations of the rioters. ‘Dissident’ republicans and so-called ‘anti-social elements’ have been blamed for fuelling the violence, while the incendiary actions of the anti-Catholic Orange Order airburshed from media reports. In response, DUP leader Robinson labelled his comments “unhelpful” and “unacceptable”. Later however, Robinson and McGuinness, issued a joint statement praising the PSNI and condemning what they called “outright thuggery and vandalism” of the Ardoyne protestors. “This will require the community to stand united against all those forces seeking to bring conflict back to our streets,” Mr McGuinness said. In sharp contrast, the general secretary of eirigi, Breandan Mac Cionnaith, praised the residents of Ardoyne for the “disciplined, dignified manner” in which they objected to the march. “The people of Ardoyne, like people everywhere, have fundamental human rights. One of these rights is to be able to live free from the threat of sectarian harassment. Mr Mac Cionnaith, who is also the spokesman for the Garvaghy Road Residents Coalition, described the Ardoyne sit-down protest as “a commendable example of resistance”. “The Six County Parades Commission now needs to realise that the residents of Ardoyne will not meekly accept being walked over by triumphalist bigots, nor should they be expected to. Sinn Fein Assembly member Gerry Kelly said the confrontation had been brought about by the insistence of the Orange Order to march through three nationalist areas, and the decision of the Parades Commission to facilitate them in this. He pointed to the commission’s decision to reroute last month’s ‘Tour of the North’, which also would have passed through the same area, and it resulted in a relatively peaceful parade. He said the rioting was “wrong, counterproductive and should not have happened”, but the decision of the PSNI to fire plastic bullets was also “wrong and unacceptable”. He condemned what he described as “small factions” including the Greater Ardoyne Residents Collective (GARC), a local residents committee and eirigi for staging the sit-down protest. He claimed it had undermined a protest by another, Sinn Fein endorsed, residents group. “The rioting which took place here... did so after the Orange Parade had passed. “Residents of these areas do not want it, what they wanted was to protest peacefully against the sectarian parade being forced through their communities, not an excuse for anti-social elements to hijack cars, abuse local people and throw petrol bombs. “And I would appeal to these people to return to their own areas and allow the people of Mountainview, the Dales and Ardoyne to get on with their lives. Republican Sinn Fein congratulated the Ardoyne residents for their “steadfast opposition” to the sectarian march. It also criticised what it said was Gerry Kelly’s “lies and spin” in giving the impression of having played a mediating role in the conflict. GARC spokesperson Martin Og Meehan said his organisation had appealed for a peaceful and dignified protest on Monday evening. “Our activists also appealed and remonstrated with youth people to refrain from acts of violence,” he said. “However, as history has shown, their anger and frustration against an unwelcome parade again spilled over.